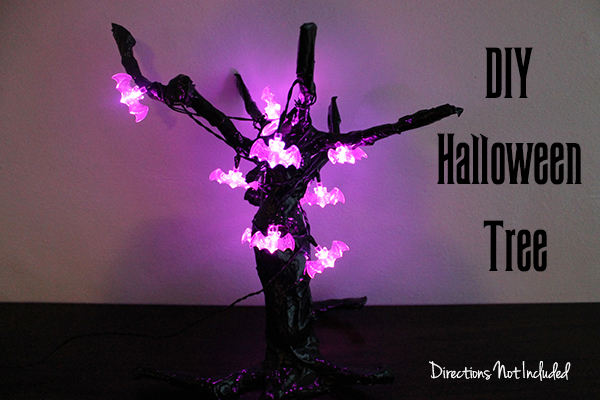 Quite some time ago I pinned this awesome Halloween tree. I kept going back to it on my Halloween board for inspiration, and then finally realized it was Gretchen’s from Boxy Colonial’s. She scored this amazing tree at a thrift store for next to nothing and decked it out with a handmade banner and lights. Color me jealous, because thrift stores in South Florida are horrendous so there was no way I was going to find a Halloween tree like that (or much of anything for that matter). But I wanted one. I really, really wanted one. My internet search was pretty futile so I decided to try and make one. 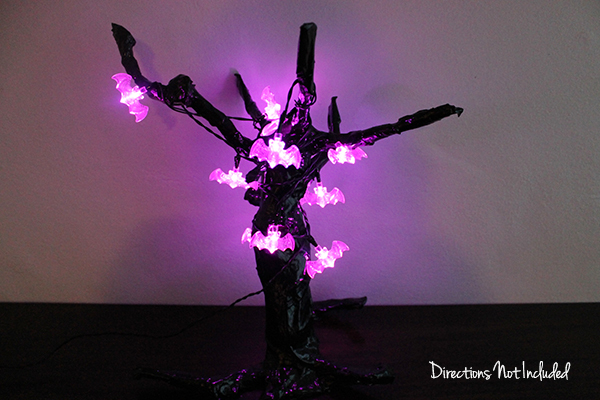 This is a complete experiment to try and make a DIY Halloween tree. I didn’t have high expectations, but I’ve been pleasantly surprised. 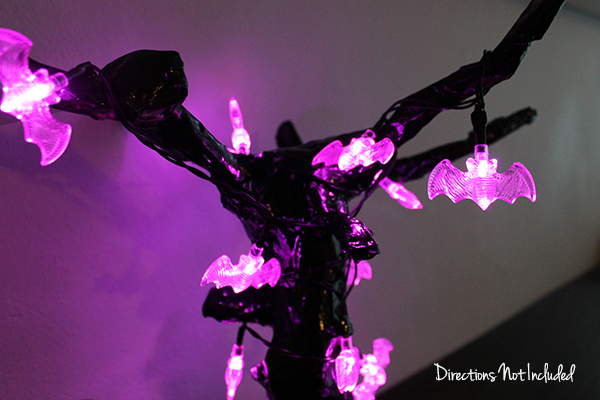 I started off with some wire I bought at Home Depot for some other Halloween decorations from last year. 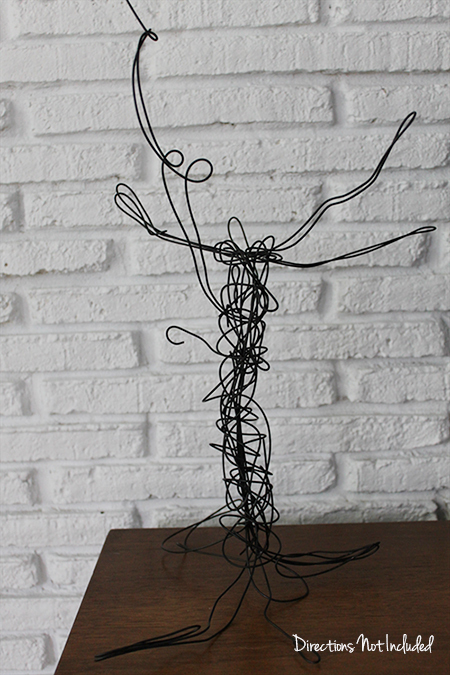 I made the very crude shape of a spooky tree. Very crude. Building this form up with paper mache was my initial thought, even though I hadn’t worked with it since I was probably 8 and made a ladybug stool during camp. 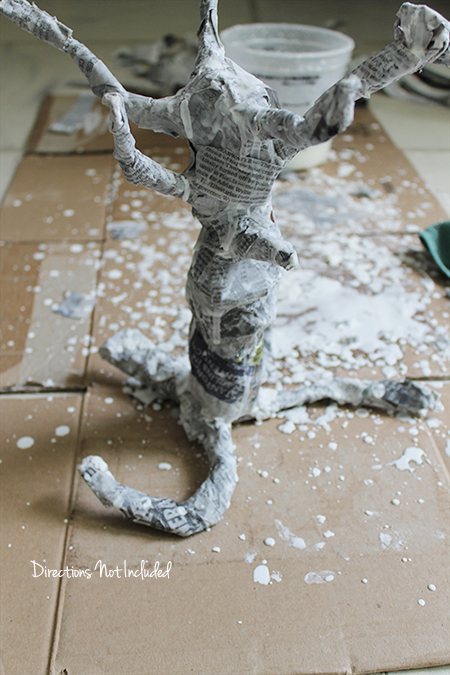 The thing with paper mache is that it uses flour. I have Celiac disease which means no wheat flour for me at all – I can’t ingest it and I don’t want to touch it either. 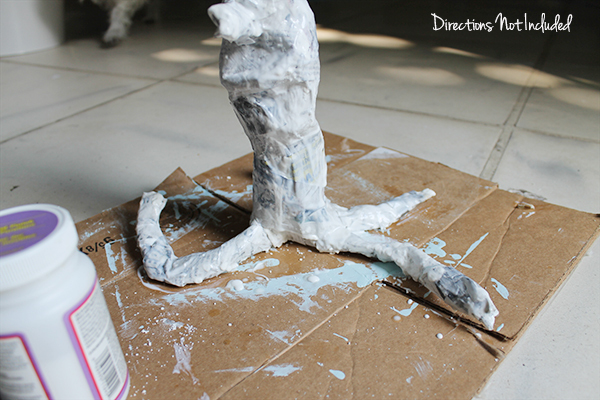 I found a gluten free paper mache recipe and decided to try that. I am the messiest crafter ever. This was such a disaster mess-wise. Ray had to take pictures of what I was doing and I wasn’t allowed to touch anything in the house. During this, I knew he wanted to throw me outside and hose me off. Being that it was a million degrees outside, I had to make it inside. The mosquitoes and heat are just insane this time of year. Messy as it was, it worked. 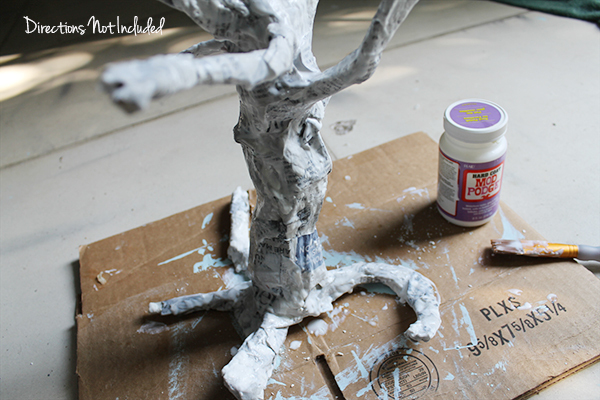 I kept adding layers of newspaper to create the form of the Halloween tree. The more I added, the better it looked. Now here is the thing. 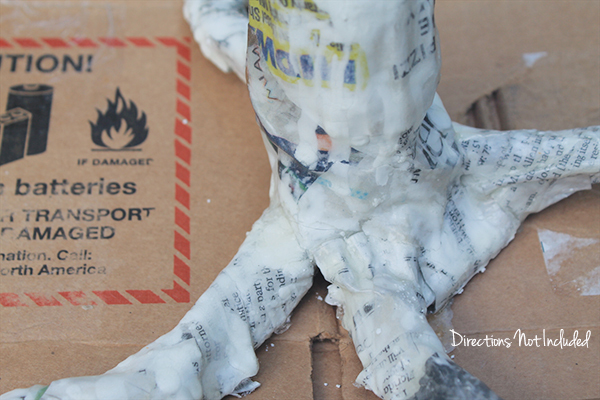 I didn’t add glue or another additive to the GF paper mache mixture so it was a little softer than I thought. 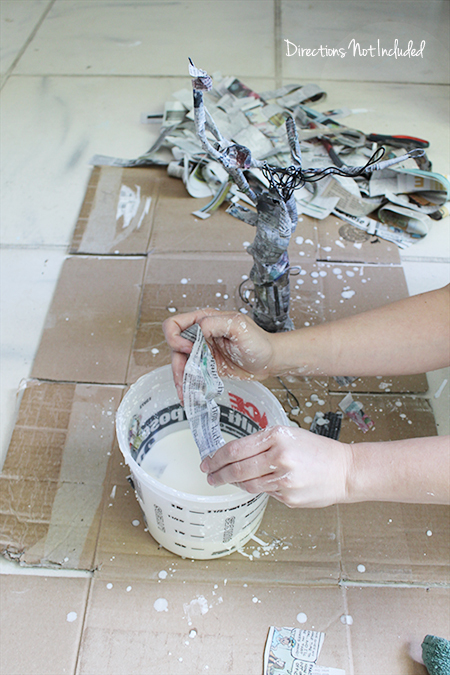 I decided to use some Mod Podge to help seal and harden the tree. I used the Hard Finish kind and just glopped it on. Yes, “glopped” is a word now. Normally, I follow all instructions and use a paint brush or sponge to very lightly add layers of Mod Podge to any piece I work on. That said, for this Halloween tree, adding heavy layers added more character and fullness to the tree. 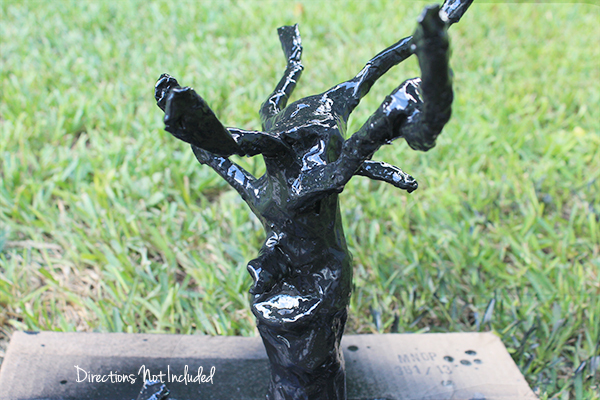 After a handful of Mod Podge layers, I spray painted the whole thing black. 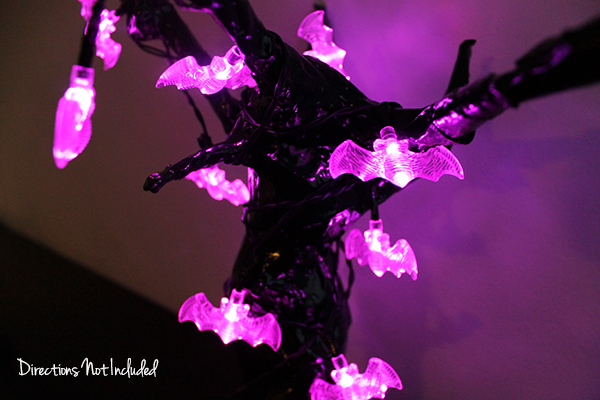 Wrap some mini-Halloween bat-shaped lights, and you have your very own DIY Halloween Tree. It actually looks good in the sunlight too. I’m just too lazy to take another photo. 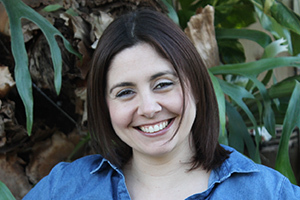 Thank you, Gretchen for the inspiration. I’m excited to add this to my Halloween decor this year. Now if I can only decide where to display it. oh how cool! i love that, anna! That looks so cool! What a great idea! You did such a great job, and your Halloween tree is so cute! I think the outside picture of it looks like it even has a scary face on it. I think I might try this and try to make it have a face in the trunk, with mean-looking eyebrows! You should make one! I had grand ideas of something more detailed, but I never got around to it. There were some cool tutorials out there for very detailed spooky trees.